Palma de Mallorca is Mallorca’s (known to the British as Majorca) capital city and is the largest city on the island, known for its historic sites, contemporary bars and restaurants, and its lively nightlife that matches any of the surrounding Islands. A must see is Mallorca's Caves. Among the 200 or so Caves, The Dragon Caves are the most popular, featuring massive underground lakes, stalagmites, all of which makes them very popular with tourists. While there you have to try the local cuisine it's superb, a real wining and dinning time out, sampling the taste of Majorca. A traditional dish is a simple crusty loaf and olive oil combo that takes on many forms depending where you decide to visit; served with the usual regional sausages meats and cheeses. You can't visit Majorca without sampling tapas – a combination of small dishes like fried vegetables (baby onions and baby cucumbers), potatoes (fried potato dices), seafood (tuna, scallops and cod), meatballs and herbs, to name but a few. The beaches which are in fact some of the best in the Balearics, they are very clean and kept to a high standard, giving you time to relax and take in there beauty. They are usually pretty quiet, however, there are loads of beach activities such as snorkelling and jet skiing. 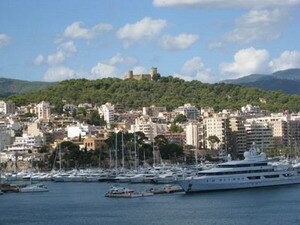 The sea is turquoise tranquil and crystal clear, another attribute Majorca is best known for. If you are looking for a place to take the kids Aquacity, the water park is where you can find loads of big pools, fast flumes and playgrounds. The Dolphins perform amazing tricks at Marineland which in fact also feature cute and clever sea lions. If you are there as a couple or with friends and family, there are numerous fine art galleries and museums. The lively nightlife offers restaurants, bars, theatres and massive nightclubs. Shopping is also a great plus with many designer boutiques all situated in the shopping malls. Majorca is said to be the most picturesque and beautiful of all the Balearic Islands, catering for families and couples making a perfect destination to soak up the sun and have an unforgettable getaway.